Boston Magazine – Best (Home!) Schools Issue | OFF KLTR! 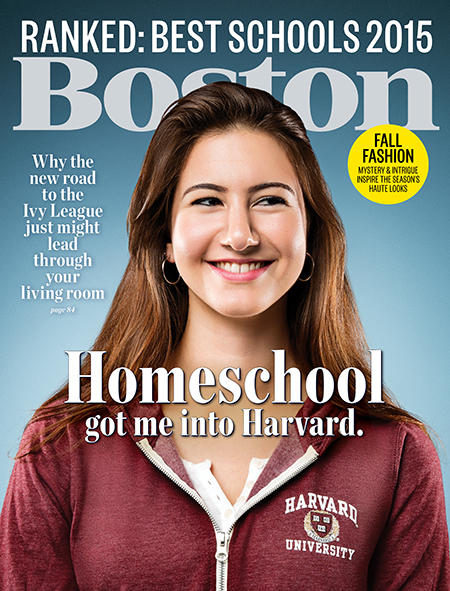 I am thrilled to be quoted in the homeschooling article in September’s issue of Boston Magazine! How amazing is it that a life-long homeschooler is on the cover of the Best Schools Issue?! I’ve read the article multiple times and I love how well the reporter describes all of the opportunities available to homeschoolers in the city! It’s truly great to be a homeschooler in the Boston area! But, the more times that I read the article, the more I wish that the reporter had explicitly outlined the difference between the two homeschool methodologies intertwined throughout the article: (1) the whole-life learning approach (also called unschooling) and (2) the school-at-home model. Claire Dickson, the lovely young woman in the cover photo (who will attend Harvard in the fall) and her family are unschoolers. My family also follows a whole-life learning model. Our children are encouraged to follow their own interests and passions. We parents serve as our children’s guides. The unschooling model is in stark contrast with the school-at-home, teacher-directed model that the reporter describes through her visit with the Holzbach family (in Winthrop). The article contained a “sample task list from a recent day of homeschooling: two hours of math, a one-hour history lecture, 40 minutes discussing the Brooklyn Bridge, time spent on Portuguese, 90 minutes of history reading”. In this school-at-home model, the parent assumes the traditional role of teacher and sets the educational agenda. The parent drives the child’s education. I support every family’s right to choose the best educational philosophy for educating their children. Period. No if’s, and’s or but’s. However, taking school out of the classroom and simply moving it to the kitchen table (or bean bags or couch) wouldn’t have worked for my family! We needed a new model. A not-school model. An unschooling model. Unschoolers are encouraged (and guided) to explore what interests them. For example, my older daughter loves sewing and fashion. She takes a sewing class (math and measurement) and we do lots of reading about historical costumes and the lives of children living in the corresponding time periods (history and reading). My big girl loves being a homeschooler. She loves to read. She is quick to delve into researching anything and everything that interests her. She is a self-directed learner and I am her guide. Congratulations and that’s amazing that unschooling is getting its mention in the school issue! What progress! !